I have a new goal of getting as many tassels scattered around the house and on my person as possible. 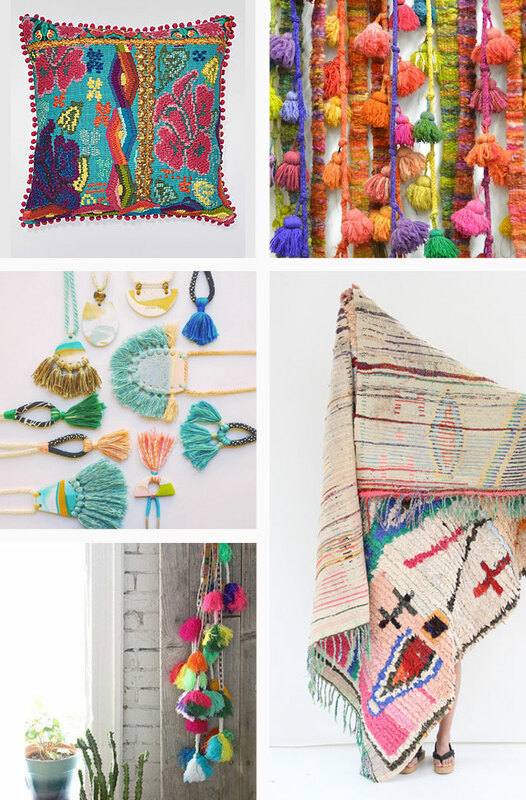 I was searching for tassels for a project I am planning and couldn't help but find so much other tassel inspiration along the way. Marks and Spencer cushion - I was in M&S looking for a swimming costume (the selection is awful) and came across their fab homeware section instead. There was so much I could have bought but fell in love with this cushion, its much nicer in real life so hoping it will go on sale at some point. I discovered some great sources to buy interesting tassels for craft projects and general use. @Kelaoke - on Instagram is my new favourite, I just love her jewellery designs. She has an Etsy shop too. I love this boucherouite rug from Buklina, I was searching for an image for this post but got sucked into dreaming about how much I need one of these rugs - love!